This post originally appeared on here back in 2012 from Monica from East Coast Creative and is by far in the top 5 posts on Infarrantly Creative. Apparently, you guys have a lot of brick fireplaces going on that need a little whitewashing. So let’s take another look at this timeless idea…. Even though gold jewelry is back in style, a dated, brassy fireplace can put a major damper on the style of a room! 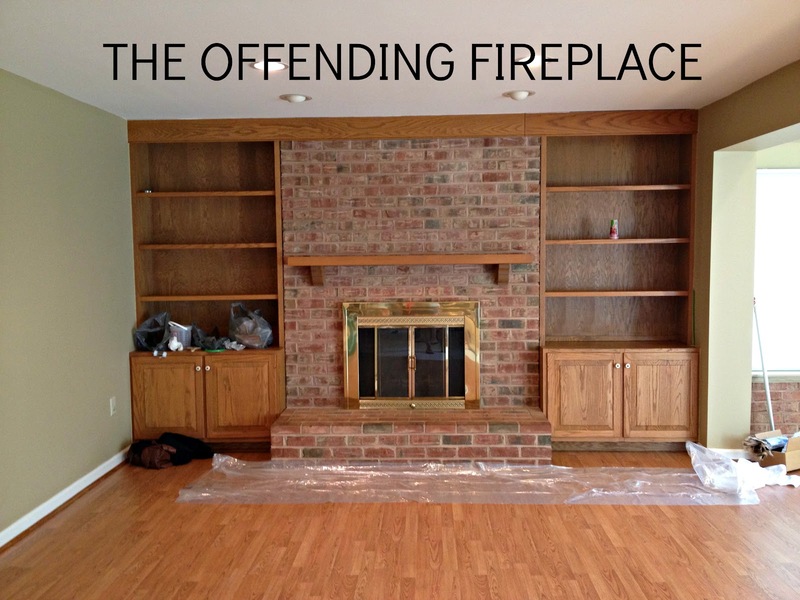 Updating your fireplace can seem overwhelming, but let me tell you it’s not as hard as it seems and if you’re really determined (like me) you can get it done less than 24 hours! Here’s the story behind this makeover… One of my best gal pals was moving into a new house, so I trucked on down to Maryland to help move and to try to tackle a few fun projects. The fireplace wasn’t even something they had thought of me working on, but the moment I walked in, it was SCREAMING for an overhaul. 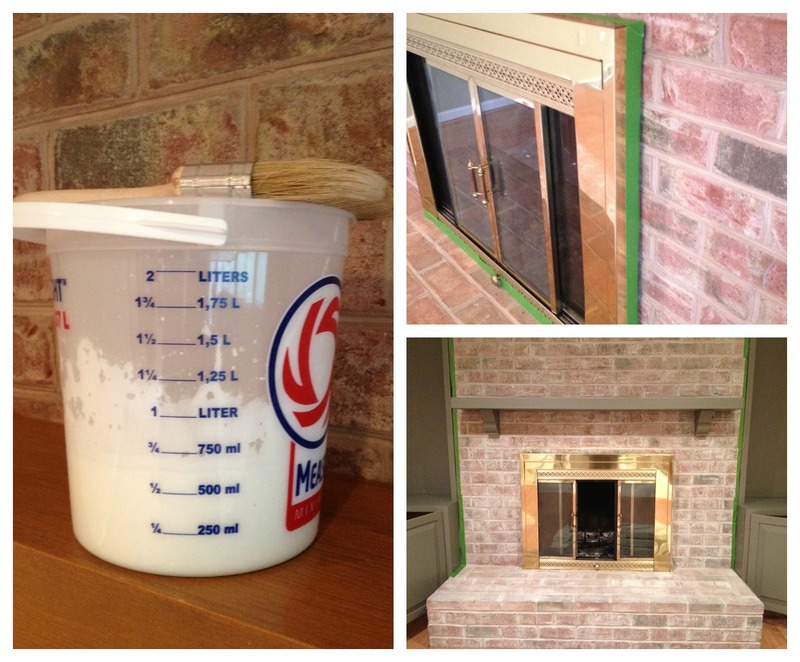 Whitewashing brick is really simple! You’ll need an inexpensive paint brush, a plastic container, a rag, water, and paint. I mixed regular latex paint and water with a ratio of 1 part paint to 3 parts water. If you want more coverage, increase your paint and for less coverage increase the water. Start in one corner and work in small sections. Your paint mix will be really thin, so you’ll want the rag in hand to catch any drips. Brush your paint mix on a 1’x1’ area and then immediately use your rag to rub it deeply into the brick and then remove any excess. The process goes really quickly, but I’ll warn you it’s a little messy. The grout can be a tad sandy, so you’ll definitely need to vacuum when you’re done. The whole fireplace and hearth took me less than 30 minutes. The difference in color is awesome! After whitewashing and painting the shelves and mantle, it was time to get rid of that brass! 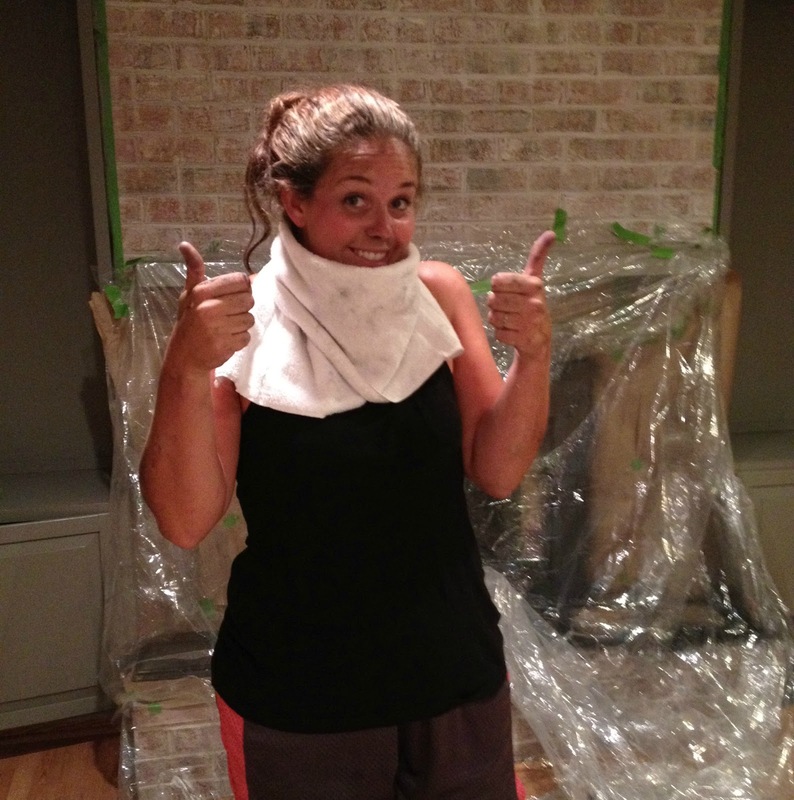 My exact words to my gal pal Mandy were, “Do you trust me?” and I’m so glad she did!How to spray paint a brass fireplace surround:There are some key items you’ll need to do this project right: Frog tape, craft paper, disposable plastic drop cloth, and Rust-oleum High Heat Ultra Spray Paint We started by taping off the brick right around the surround. Make sure that you get it as close as possible. We were lucky enough that the tape could slip behind the surround, so there was no chance of bleeding through. Once the edges are take care of, you’ll want to use the craft paper and tape to make sure all of the brick is covered. It’s sorta like wrapping a really big, awkward present! Once the brick was covered, we cut a section from the plastic drop cloth and wrapped the mantle in it. We were really careful to make sure we’d taped it tightly, so no paint could sneak in. For the glass doors, we used more tape and paper. I found that if I used a spatula, I could get the tape really close to the edges for a perfect, crisp look. Now it was time for a little craziness… Making a spray paint cocoon! Since we were spraying in the house, we needed to seal off everything. Basically, I got in, and we sealed the drop cloth all around me. WARNING: The fumes will be very strong. I recommend a face mask. I didn’t have one, so we used a towel. Thankfully, this paint is awesome and doesn’t require more than one solid coat. I, on the other hand, required about 3 showers before all the black paint was off my face and hands! It was totally worth it though! Here’s the finished product. Doesn’t it look so much better? I’d love to show you a perfectly styled mantle, with all the doors on, but we were on a tight time schedule, and I had to get back to PA. So this was DIY on the fly! I was so pleased with the update and loved that the entire project took about 4 hours of work time and cost less than $30.00! If you have a fireplace that you were wishing you could change, I totally recommend doing it yourself! The impact it can have on a space is incredible! 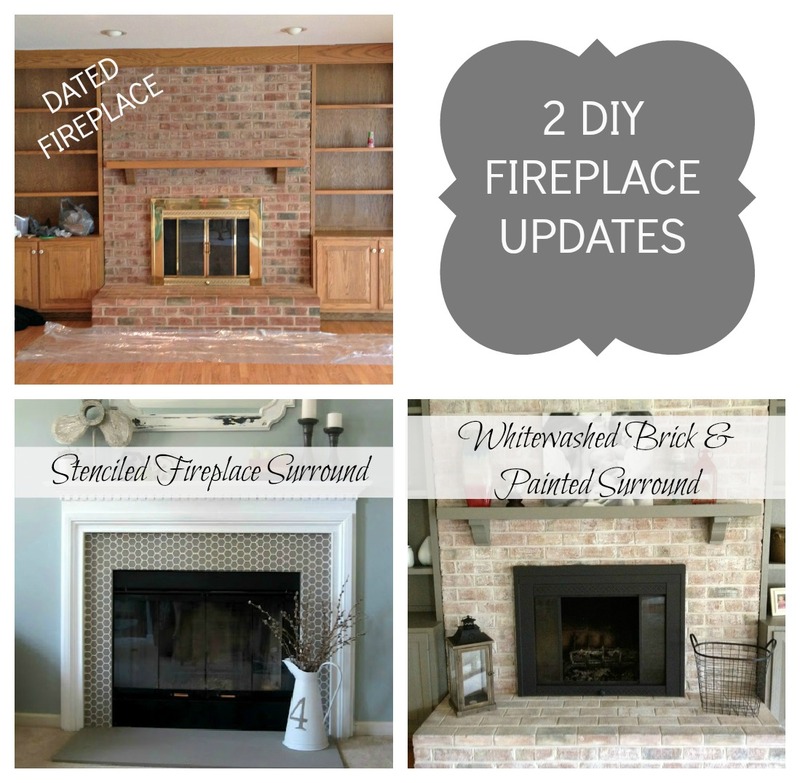 If you missed it, last month Jess shared another DIY Fireplace Update. It was pretty awesome and I’m not just saying it because she’s my BFF!